These little guys are deceptively delicious. 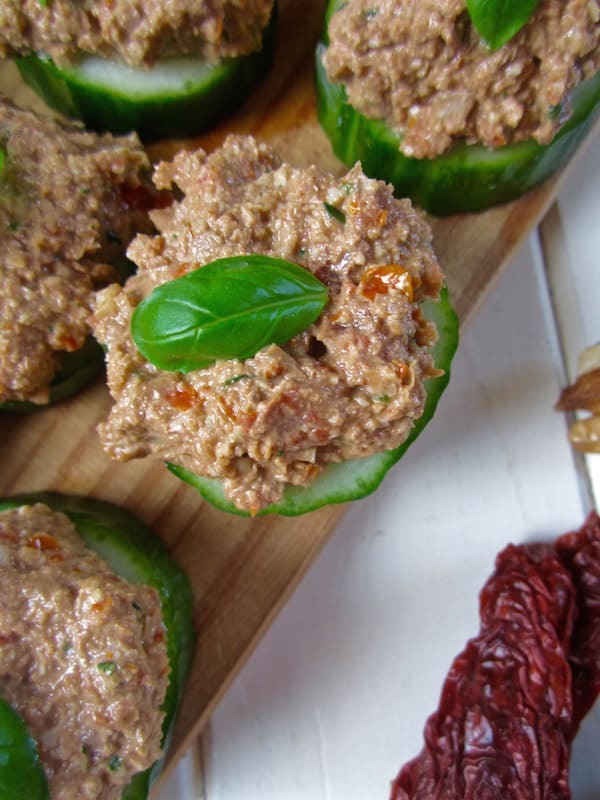 I know it’s easy to have doubts about vegan paté on cucumbers… you may be thinking, “Boring!” or “Who really cares? !” But i’m telling you, YOU do! Just try it and I know you’ll be pleasantly surprised at how simple and yet delicious these little gems are. 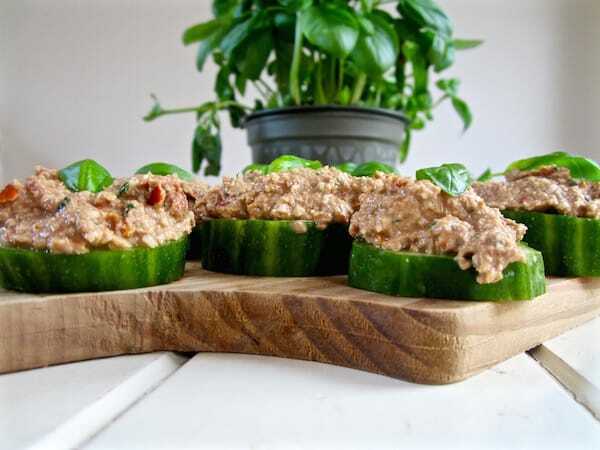 This recipe is inspired by cuisine from the country Croatia and is shared with permission from Vegan Gastronomy, a culinary academy based in Mallorca, Spain, whose focus is on teaching students to create healthy, delicious, sustainable and economical vegan dishes. I spent four days participating in their V21: Flavors of the Mediterranean cooking course, and will write a review of it soon! Among five plates of food we made during this particular day, this recipe came in as the favorite for at least half the class! It’s really the perfect light appetizer, especially in the summer, that you can easily make ahead. Have I convinced you to try it yet? For those of you who care, I’ve categorized this recipe as “raw”, even though technically most sun dried tomatoes and tamari aren’t technically raw. 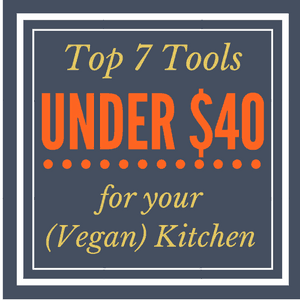 However, many raw foodies commonly use these ingredients in their diet, so if that applies to you, then this recipe is for you too! Easy, raw summer appetizer that everyone can enjoy! 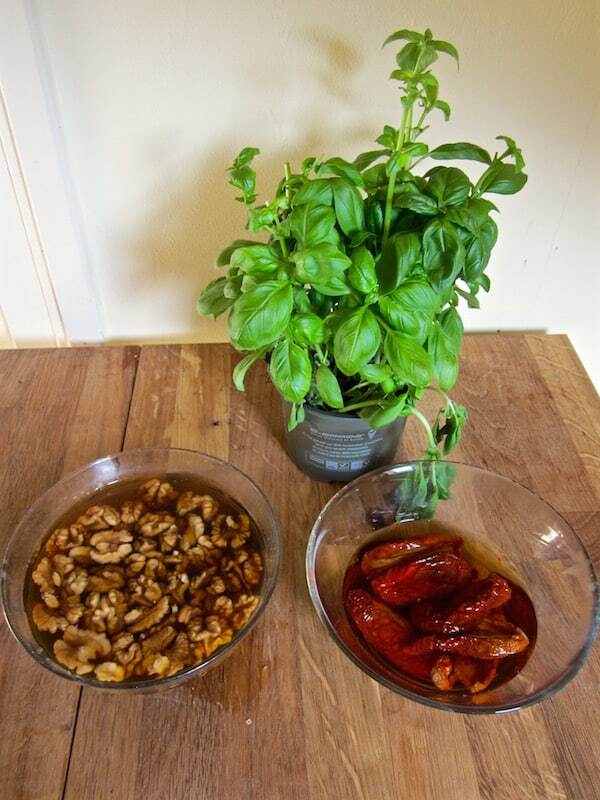 Soak the walnuts in water - you can do this overnight or if you’re short on time, you can immerse the walnuts in hot water and let soak for at least 30 minutes. Soak the sun dried tomatoes in water for at least 15 minutes. Drain but RESERVE THE SOAKING WATER. 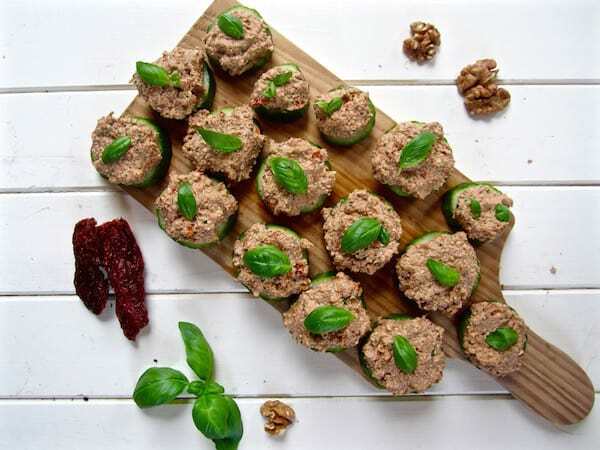 Blend all the ingredients in high speed blender or food processor, adding tomato water as necessary as to obtain a smooth, paté like consistency. Check the taste and adjust the seasonings if you feel you need to. If serving on top of cucumbers or pre-spread crackers, top each cracker or cucumber with a whole small basil leaf (as pictured). How much sun dried tomatoes? The bowl in your pic does not look like a whole cup rehydrated so am not sure what amount.... WOW this looks so luscious. 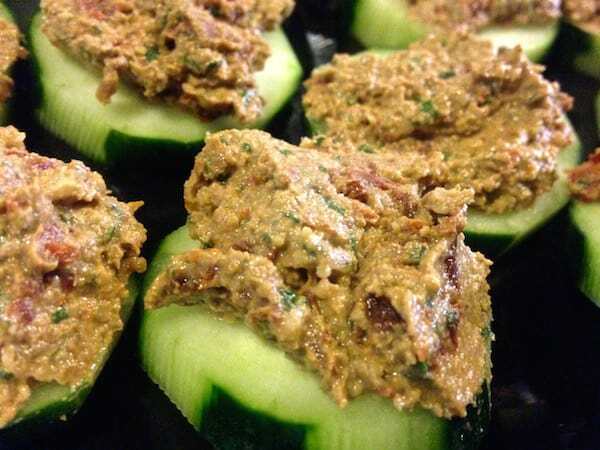 I am a big dip/spread fan so am thrilled to get this recipe! Thanks! Just want to stop by and say hi, Sarah! This pate was on my list to try and I finally made it a few weeks ago. So good! I'm so glad to hear that you enjoyed it Yang! :D I love how simple this recipe is too. Thanks for sharing! !